This is simply a group shot of my ten Shambling Zombies from the Meridian Miniatures Tooth and Sword range. I wanted a picture of all of them together so I could link from the T&S page I have set up at the head of the blog. Five were painted this year for Zomtober, while the original five were painted in 2015. Coming up I hope to start painting some more Adventurers soon to battle against them! My Week 5 Zomtober minis are done - another set of five Shambling Zombies from Meridian Miniatures' Tooth and Sword range. 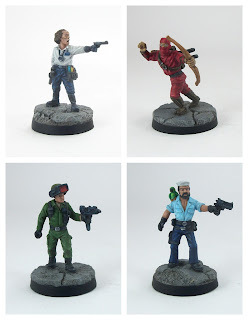 To be honest, I had planned to paint a contemporary Zombie too, but I have been feeling unwell for most of the week so decided to concentrate on these five alone which ultimately meant getting more minis painted overall - a 'good thing' in my book! The painting is pretty simple and uses my usual Zombie flesh recipe, with Vallejo Model Color Green Grey as a base, some VMC Burnt Umber mixed in to shade, then highlights by adding VMC Basic Skin Tone. The eyes are graduated from VMC Sky Grey down to Silvergrey. To speed up the painting I used VMC Camo Black Brown mixed in to shade the various trouser colours. 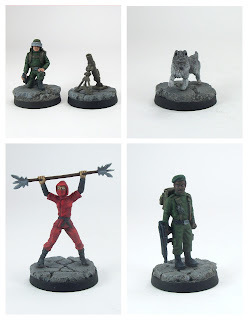 With these done I hope to get some Tooth and Sword Adventurers and some Impact Minaitures chibi Monsters painted over the next couple of months (while also cracking on with my G.I. Joe Project again), but as ever my plans will probably change with a whim! Finally, well done to every blogger who participated in this year's Zomtober, well done to everyone, and hopefully we will all sign up again next year! This Mummy was painted up as a 'quick win', done in roughly two hours (which for me is very fast, although many hobbyists paint, and speed-paint, much more quickly than me!). I tackled this one to essentially to get me back on track with painting my Zomtober mini for Week 4. The figure is produced by Impact Miniatures as part of their Chibi Adventurers and Monsters range. I picked it up to complement my Tooth and Sword Shambling Zombies (since its fits with those as they cast humans as the unliving). I went with a super simple approach, base-coating with a mix of Vallejo Tan Earth and Ivory, then dry-brushing with additional Ivory, then highlighting with the same mix to tidy up, working up to near Ivory. The skin was painted with Green-Grey, mixing in a very dark brown for shadows, then highlighting up with Green Grey mixed in, and a dab of the Tan Brown-Ivory mix. The eye was done with a near-black mix with a red iris slightly lighter in colour to its outer edge. I still have a bit of work to improve on how I do chibi eyes, but I reckon that will come with time. My plan is to get some fantasy gaming in in the next few months, basically as soon as I have a couple of parties and plenty of Monsters painted up. Another Zomtober week comes to an end, and another Zombie painted! Unlike last week's offering, there appear to be clearer causes of death for this week's Zombie - either a torn out throat or maybe a broken neck. Prior to that, it looks like she was chewed on by walkers for a little while (they seem to have taken small bites rather than going for a full course meal). Either way, she certainly carries a lot of injuries. The figure is by Studio Miniatures (as have been all the Zombies I have painted this year so far); I found some of the bits of the mini hard to figure out, but overall I do like the sculpt, and the various signs of trauma certainly make it distinctive. I went for quite a muted palette of colours with the clothing. Then, when all garments and flesh were painted, I liberally applied a mix of Tamiya Clear Red, Vallejo Smoke and Army Painted Strong Tone to areas of wounds etc and where I thought blood would spread. The flesh is my usual recipe of base Vallejo Green Grey, mixing in Burnt Umber for shading and Basic Skin Tone for highlights. This week's offering for Zomtober is another Studio Miniatures Zombie. I left this one quite late and basically did 90% of the painting this morning. That said, I am reasonably happy with it as tabletop standard and it adds another mini to the horde, and takes one more out of the unpainted pile. I am not sure what injury killed this Zombie, so I added a bloodstain to his t-shirt to indicate trauma over and above his dislodged eye. The past three weeks has seen some stunning outputs for Zomtober and to everyone taking part, well done; but I am most in awe of the painters able to complete multiple minis each week. Overall I am pretty pleased with my volume of output, in the middle of my low and high targets for July to September, but overshadowed by the amount I painted in the same period in the year before. I made significant headway into my G.I. Joe Project over the past three months, which was positive, especially as Brummie and myself have now managed to play a few games of Squad Wars to test the rules and iron out the bumps. This month I am taking a bit of a break from the Joe stuff, but I fully expect to carry on painting more next month. I also painted an Adventurer from the Meridian Miniatures Tooth and Sword range (that Bat Spell Caster below is not giant size - really! 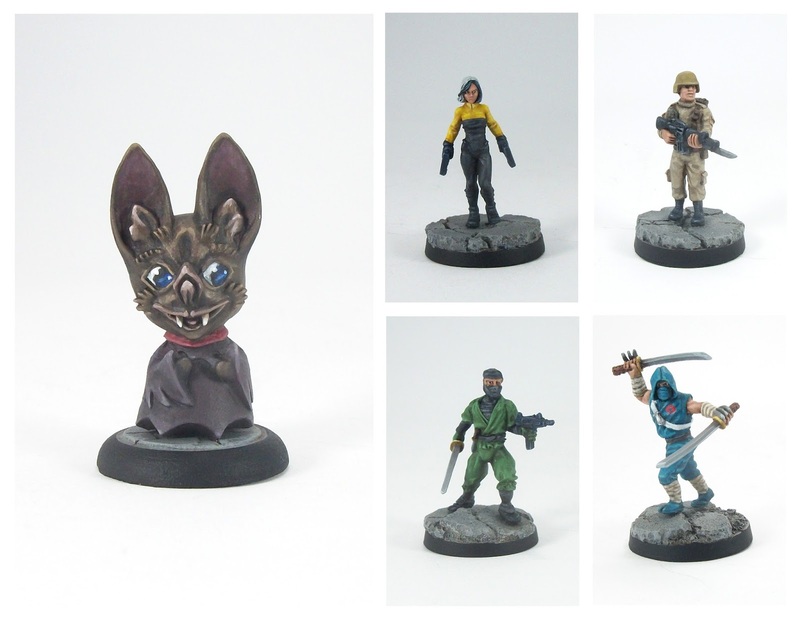 ), which was pleasing as the range has been untouched for far too long after receiving my Kickstarter pledge. This also lead to me starting and writing up a third draft of a set up rules for fantasy skirmish adventure gaming - 16,000+ words mainly written in September for that! I hope to get some fantasy scenery done before too long to go with more Tooth and Sword minis. Finally, astute readers may have noticed an absence of BMG minis in the past few months. This is intentional. Basically due to concerns with how the 'official' BMG Facebook community is run, and specifically certain behaviours of its lead admin (most stuff I won't go into, but stuff that is so bizarre to sound made up in some instances, and just downright wrong in other instances), including exclusion of community members seemingly by whim in certain instances, including myself. Therefore, I am no longer buying Knight Models products, attending their officially-sanctioned tournaments nor will I be blogging about their products until and if there is a notable change in the status quo. I have had civil conversations with Knight Models on the matter, and I have explained why I will no longer be supporting them or their products while the situation remains unchanged, and they have stated they are considering the situation. I'll miss attending the tournaments and playing BMG against Brummie, but for me it is a matter of principle. Anyhoo, I am hoping to keep painting momentum through the next few weeks and will hopefully churn out a few more minis. A bit of an odd one this, amid this month's Zomtober outputs, and mainly finished because Zomtober has seemingly reignited some painting motivation. Mimics are tried and true Dungeons & Dragons monsters that have popped up in other franchises such as Japanese console rpgs. They are creatures which inhabit dungeons pretending to be treasure chests etc. in order to pounce on unsuspecting adventurers! This sculpt is from Reaper Miniatures and is cast in their Bones material. I did a poor job of clean up, and I have to say I really don't like the Bones material at all. Cheap is great, but in hindsight I would have probably preferred to do this one in white metal, and would likely have cleaned it up better had that been the case. I have a Fantasy Gaming Project looming (probably using Tooth & Sword minis for the protagonists and many/some of the antagonists), so the Mimic is intended to be part of that. I have already picked up another couple of Mimics from another manufacturer so expect to see something similar in the not too distant future. More details in due course! This week's offering is a mini that was started but not finished for last Zomtober; he has basically sat part-painted for a year, meaning I am very glad to clear something out of the dreaded painting queue! It has been great to see so many Zomtoberists progress to Week 2, so very well done guys. This week's mini is from Studio Miniatures, and I think of it as part of my sub-set of Mutant Zombies. Most of my Mutant Zombies so far have also been Big/Boss Zombies so this is a nice addition to those ranks as a smaller model. 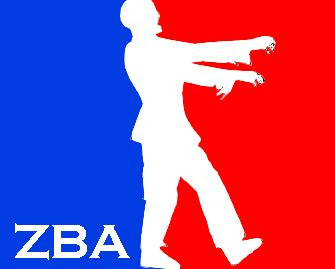 No blood splatters on this one, but the remainder of the month will see more regular Zombies stumbling forth. My Zomtober Week 1 mini is in the bag, phew! I had a slow painting month in August, so Zomtober is just the ticket to help me pull up my totals for the year. Having the mutual support of other Zomtoberists is a great spur for me to get 'something done', so well thanks and done to the 20 or so of us who have decided to take part this year. Zomtober has helped me paint at least 30 minis over the 5 years it has been going, and this is the 24th modern Zombie I have added to my collection due to Zomtober (taking me to a nice round 40 in total). I am not pursuing any kind of theme this year, just clearing odds and ends from years' worth of backlog Zombies, including this mini from Studio Miniatures. I imagine that prior to rising as a Zombie, this one had its neck chewed and hand chewed away then his neck broken before dying - very unfortunate! I used this mini to try out how I shade and highlight what is a fairly new colour for me (the brown used for the long sleeve t-shirt), since I'll be using the same colour on another mini I have coming up. I may add some new acquisitions to the Zomtober painting queue, but that will depend on overall progress.